Intimidate your job with the Intimidator. What all can I do with the Intimidator? Where are the Danuser products made? Normal wait time after product is ordered? Do I have to pay NC Sales tax? Yes, If you are a NC resident without NC DR tax exempt account. No, If we are shipping to an address outside NC. Where can I pick up the unit and avoid shipping costs? Statesville, NC - week days, after pre-payment, at our distribution center. We can arrange for implements to be shipped to various locations and trucking terminals. Each order will be handled separately. Is this unit really as tough and strong as it appears in the video? Yes, Yes, Yes. Our customers continue to say "Yes." It is a true land-clearing, obstacle-removing attachment. It is ideal for eliminating trees, saplings, shrubs, bushes, and other obstructions on the job site or farm. It handles the toughest stumps, posts, rocks, fence rows, and land-clearing jobs. Selectively eliminate what you want. Maneuver into tight locations and next to buildings or fences with ease. Remove the complete tree or stump, roots and all. Remove larger trees, even with smaller skid-steers or tractors, using the replaceable excavator bucket teeth and vertical jaw saw teeth to dig and cut roots. 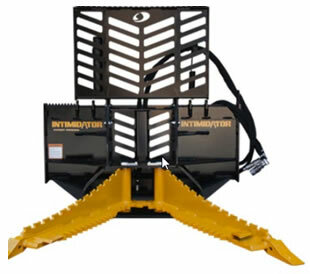 Uniquely synchronized jaws, designed for less wear and tear on the vehicle, are actuated by a rear-mounted, fully-protected 3" diameter cylinder, allowing the operator to aggressively excavate objects without fear of damage to the cylinder. Tapered jaws allow for larger trees to be gripped near the back of the jaws, maximizing pulling force. The bidirectional side saw teeth on the 12200T model provide a more aggressive design that allows you to cut off trees flush to the ground. Lower operating costs than a bulldozer and less work than a chainsaw. carver@carverequipment.com to order, request quotes, etc. When sending e-mail request and forms, expect a response within 24 hours weekdays, 48 hours during weekends. We are not able to get firm freight quotes on weekends therefore the quote maybe delayed. Sales tax will not be added except for NC buyers without NCDOR farm exemption certificate.